Timothy and Janepher Kakooza have lived in Katosi on the shores of Lake Victoria since the mid 1990's. They went there to establish a church as part of a church planting vision for the islands of Lake Victoria. Very quickly they discovered the severe poverty in the area largely bought about by the undisciplined lifestyle of the fishermen so they started a school, then a hostel and a clinic to deal with the issues (UGA01a). In the process of living and serving there, they discovered the little village of Mbale, about 10 kms around the lake from Katosi. Mbale village was formed by internally displaced people from the city of Mbale. They are poor and trying to eke out a living from fishing. There is a great deal of drunkenness, abuse and very few children were going to school. Timothy and Janepher felt obligated to do something so sent some teachers over there to start a school (Photo of teachers above). Temporary buildings were erected and children were gathered together. That was in 2010 and now there is an established programme, the parents love the assistance and a little church gathers there. Since 2012 Timothy and Janepher have been able to build a new classroom block which now houses the children and the old classroom block is used for the preparation and serving of the daily meal which the school provides. In 2015 there were approx 100 children in the school. They still have a considerable distance to go in developing resources but the teachers remain committed to the school. 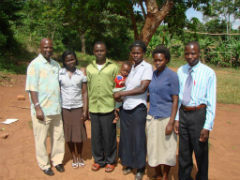 In 2010, soon after it was established, Timothy took the BHW Field Director to visit Mable and on subsequent trips to Uganda, more visits were made. It became obvious that these children are very vulnerable, that Timothy and his team are committed to the place and that there was a good uptake from the local people. Therefore, in 2012 it was decided that this was a group of people BHW should become involved with and we started to assist. 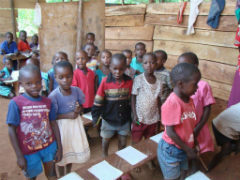 Initially the financial support is to assist with teacher's salaries and to help with some daily food for the children. 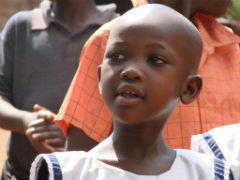 The main beneficiaries are the young children living in Mbale village. Prior to this school being established they had little hope of getting an education. This lack of education would be an impediment to them ever being able to have lives of significance. When the school started nearly all of the children irrespective of age went into the early class as they could not read. This has created a number of issues with a wide range of ages and maturity in all the classes. The families living in the village are also beneficiaries. Educated children will always be of benefit in poverty affected areas. The parents here do not value education. Many of the children are from single parent families, there is a lot of relational strife and many neglected kids. The commitment of Timothy and Janepher and their team to intervene in a desperate situation. The willingness of young Christian teachers to go to this difficult area to serve the community and the children. They receive very little pay for doing this. The acceptance by the women of the village. There are not many men in the village - they are often away for long periods trying to find work and fish. They drink a lot of liquor and are generally irresponsible with their families. 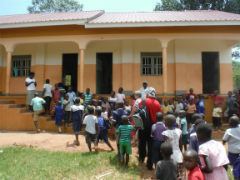 The development of a church in the community alongside the school activity. This caters for the spiritual needs of the community as well as the educational needs. This is very important for BHW. This is related to and grew out of UGA01a. The same people have initiated this partnership. As an older Christian he had a visions to help kids that grew up like he had. And so he began to look for ways to help children. Initially he came to Katosi as it was a poor community and in the process of planting a church in this community discovered that there were many needy children amongst them. So he and Janepher began a school and a hostel for those without homes and the work keeps growing. Timothy has been married for more than 20 years to Janepher and they have three daughters and one son. 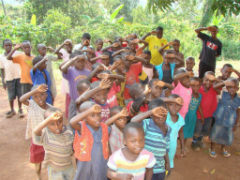 He is the pastor of Community Concern Ministries, and Director of Katosi Community Orphanage home/school. The vision of the Chosen Generation School is to improve the living standards of Mbale village and bring positive transformation, starting with the children. The initial strategy was for this initiative to just be a preschool and kindergarten with perhaps Grades 1-3. 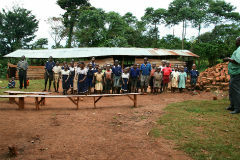 By that stage the children would be old enough to walk to other schools or board at Katosi. However the number of children has increased dramatically indicating that the school needs to become permanent and the plan now is to develop a school going right through to Grade 7. This will be done over a number of years, adding classes from year to year as the children grow. By 2017 they will have to decide if they should develop a secondary school here as well.